Worthlessness. Disappointment. Boredom. Hellishness. Despair. The eleven stories in Lynn Coady’s debut collection (which followed her astonishingly successful debut novel Strange Heaven) are not for the faint-of-heart. You won’t miss these things. You can’t miss them. But they’re not as simple as they seem. Worthlessness slips into striving. Boredom translates into comfort. Hellishness becomes familiar. For me, the characters in this story leap off the page. It’s almost overwhelming. With the exception of her boyfriend, John, the reader meets the characters in this one right along with Bethany. She has gone to visit John’s family and we are introduced to them — his father and mother, his sister (Ann), his brother (Hugh), and Uncle Lachie — just as she is introduced, and we get acquainted — er, adjust — just as she does. And, yes, I remembered their names without prompting: they are a memorable bunch. What is most memorable, however, is the change that Bethany herself experiences throughout this story. This is the part that I found so disturbing — it’s actually left a taste in my mouth, and it’s not exactly a good taste, which was true of Jhumpa Lahiri’s The Namesake as well — but, paradoxically, for Bethany, the story ends with a burst of pleasure. Obliquely contrasting emotions and experiences characterize many of the stories in this collection: euphoria and desperation, celebration and regret, stagnancy and propulsion, triumph and loneliness. It’s an unsettling but also powerful device; it’s the kind of thing that makes for a good discussion between bookish friends. For me, the bulk of that discussion would centre around the stories’ endings; often the final scenes are particularly dynamic. It’s not so much that they offer a new piece of information that you might want to discuss, but that they reveal that you didn’t have all the information that you thought you had to start with, that you hadn’t even quite understood what was missing. Just a few paragraphs ago, I was pulling quotes about worthlessness and despair from those stories, but they’re also about endurance and determination. There is that dichotomy of emotions and experience again. Is that what it comes down to? In some ways, yes, the stories in this collection are about horrible things, things we recognize as horrible immediately and things that are recognized later to have been horrible. The fruit-thrower is not a horrible person, but she did something horrible. And later she felt horrible about it, though at the time, she didn’t feel horrible. But that’s not what makes the stories so disturbing. What makes the stories so disturbing is that any one of us could have been that person throwing fruit. Which is what sometimes makes you feel horrible when you’re reading these stories. Which is also what makes the stories so good. 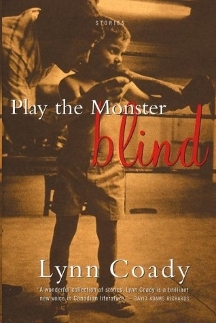 Which is also why I now want to start at the beginning of my Lynn Coady shelf and read straight through, book by book. Companion Reads: Caroline Adderson’s Bad Imaginings (1993); Alissa York’s Any Given Power (1999). This links to Gavin’s thoughts on this collection: check it out…she admires them too!